Change the energy of a room, change your mood, your ability to concentrate, heal, soothe with a quick spritz of Energy Spray. Use this instead of or in conjunction with smudging with smoke. Use in any space including home, office, car, RV, locker. Spray into your bath, onto your linens. Spray up into the air and walk through the mist to scent yourself and clear your aura. Relax, be healthy, sleep well! A few spritzes of this spray into the center of a room will help to clear your mind, boost your immune system and self-confidence, and help you to feel happy, calm, and soothed. You can spray this at the office, in your car, at home, onto your linens, into your bath. Spray into the air and walk through the mist. An intense blend of healing, clearing, protective, soothing, peaceful, joyful plant and flower oils. Shake well, then spray. All-natural. 2 ounce bottle. Bottle may be yellow, pink, or blue. Use in any space including home, office, car, RV, locker. Spray into your bath, onto your linens. Spray up into the air and walk through the mist to scent yourself and clear your aura. Soothe your emotions, banish unwanted energy, and bring in happiness. This specially-created formula was channeled from the angels to help you change your life for the better, and enjoy the fragrance while you do it. Put a smile on anyone who walks into the room. Clear the air after an argument. Regain balance, peace, and joy. Great to keep in your office for a pick-me-up. Clears headaches, helps you to stay focused, on-task, and very productive. Try this instead of those power drinks that are hard on your adrenals. You and your co-workers will love the scent. Use at home, in the office, your car, while camping, in your locker, on your linens. Spray up into the air and walk through the mist. Use this instead of burning sage to clear a room of unwanted or stagnant energies. A wonderful angel-guided blend of essential oils will make your room smell wonderful and call in harmony, love, relaxation and peace. Spray a few spritzes into a room, a gym locker, your car, office, RV. Spray up in the air and walk through the mist. A modern version of the ancient technique of smudging. Use this spray to clear the energy of a room, vehicle, object. Maybe even your significant other. Spray a cloud into the air and walk through it to clear yourself. Native Americans have long used smudging in the same way, but it involves carefully burning smokey herbs. It’s very effective, but not always safe or allowed in certain buildings due to fire codes. 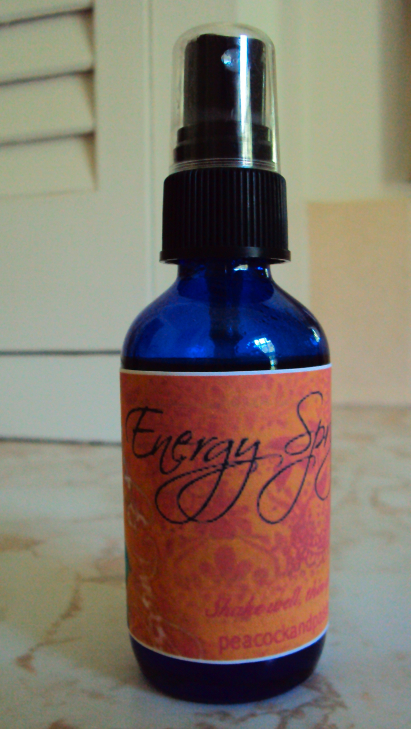 This spray has the same effect, but with a lovely clear lavender scent with herbal undertones and no smoke. Great for summer. Mint and lime. Cheer yourself up in an instant. Neutralize any unpleasant odors. Clear away fear, stress, discomfort. Trouble getting to sleep? Spritz away anxiety, stress, and the boogeyman with this soothing, clearing spray. Fall asleep quickly and deeply. Enjoy a restful night and awake refreshed and ready for the day. Blessings, love, and sensuality abound. Clear away disharmony and dischord, anger, resentment, and ignite passion, desire and togetherness. Shake well –until liquid looks “milky”– then spray. Use in any space including home, office, car, RV, locker. Spray into your bath water. It’s perfectly fine to breathe this and to get it on your skin, linens, clothing, but not so great for furniture finish, and please test an inconspicuous corner of fabric before applying. Keep mist away from cats and their food. 2 ounce bottle. Bottle is cobalt blue.